The music of the late, great Rory Gallagher lives on in the hands of Band Of Friends who play Chichester’s Chichester Inn on Wednesday, April 15 at 8pm (01243 783185). Driving it are bassist Gerry McAvoy and drummer Ted McKenna, who both worked with Rory. They are joined by vocalist Marcel Scherpenzeel who’s got something of Rory about him whilst being very much his own man, Gerry says. Gerry appeared on every Gallagher studio album until the bandleader’s death in 1995. 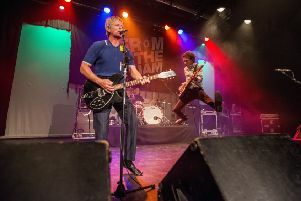 Ted appeared on Photo-Finish, Top Priority and Stage Struck as a member of the group from 1977 until 1981. After he left Rory’s band, Gerry worked with Nine Below Zero: “I left them in 2011, but before that I found this guy Marcel Scherpenzeel who is a guitar-player. The Gallagher songs are so great and just should be aired by the right musicians. “I started the band in 2011. It is still in its infancy. Marcel has his own technique, but he grew up on Rory’s music. “He emulates it very well, but I like him to play his own way as well. We started off doing Rory Gallagher songs just to try to bring it all to a wider audience and a younger audience, but at the same time we have recorded our own CD as well. After a year of action that saw them consolidate their title Best Live Band (European Blues Awards), Band Of Friends released their debut EP/DVD Too Much Is Not Enough in early 2014. The new package includes a new recording of classic Gallagher track If I Had A Reason to make up the seven-track EP. Packed alongside it is a DVD shot at Kulturhalle, Remchingen, Germany, also in 2013, featuring 11 Gallagher tracks. “We’re always going keep Rory’s songs alive, but we’re creative artists too and it’s time to make that point.